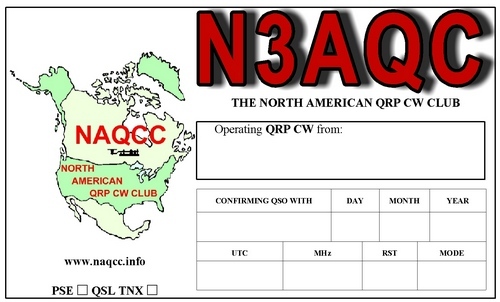 N3AQC is the club callsign of the NAQCC. Our FISTS membership number is 11900. Our SKCC membership number is 17510. Locations, times, and frequencies for our N3AQC operations can be seen on our QRZ.com page. N3AQC contacts are now on LOTW. Members may signup to use the callsign for their special QRP/CW operations but arrangements must be made in advance with club president Paul, N8XMS, at . Any other use of N3AQC is not authorized and violates FCC rules. 1. Cabrillo or ADIF file formats are preferred but spreadsheets, text files, and even paper logs (if not too long) can also be accomodated. 3. If your operation was at a special event like a hamfest please inculde that information as well. 5. If you have any questions about the QSL process please contact Gary at that same email address.